Ok first impressions are ... interesting! It's definitely a work in progress for me. I'm operating from battery - I can see a separate power supply in it's future. Wall-warts bring too much hum. Haven't tried a regulated supply (as the one mentioned). It (and I mean my build) seems voltage sensitive - go above about 12.6 VDC and the sound goes oddly bad. My sole substitution is 1.0uf instead of 2.2uf for C1 - all other parts are per schematic. Heh - I had all of it on-hand. 1. First - audio is quite good. As the article predicts, lows are great. 2. I can't get the trim-pots to go below about 9.7 volts - this is also dependent on which tube I have - I tried a variety of used 12AU7A's - some noisier than other - I have some NOS 12AU7A's coming this week, so I'm looking to try those. Swapping tubes brought the lowest to 11.2, 10.8... lowest I can reach is 9.7V. 3. Hissy - increasing volume masks it, but at least with my build, there's a good deal of constant background hiss. I'm wondering if I have some 'baked' IRF510's, LM317's show about 1.25V on the output. Or, perhaps a New- or New-Old-Stock tube will improve on it. I managed to put it all in a stock Radio Shack enclosure - 270-1805 - fielding the LM317T's and IRF510's under the metal top. On top of that, I've attached an older stick-on VGA heat-sink. Seems to be holding temps down quite well; you can rest your hand on the top with no adverse effect. Did point-to-point wiring below the top; balance of the circuit including an added 'e3' delay on a perf-board in the bottom of the enclosure. (edited) - interesting as the battery goes down in voltage, the HISS quiets down. This is an interesting little amplifier. It'll be fun tinkering with it. Subtracting the hiss - there's no other adverse noise. Lows are VERY good as the highs are still very sharp. Too late / too tired to upload some photos. Perhaps tomorrow. Tube 12AU7, ECC82, 5695 or even 12AT7. 12AX7 has too high mu and sound horrible. I was thinking and I happen to have a Mullard DCC90 twin triode (http://www.mif.pg.gda.pl/homepages/frank/sheets/030/d/DCC90.pdf) at hand so I was wondering if this might work with small mods to the circuit? "I've done this a thousand times befo..." on not voltage testing before getting to work. 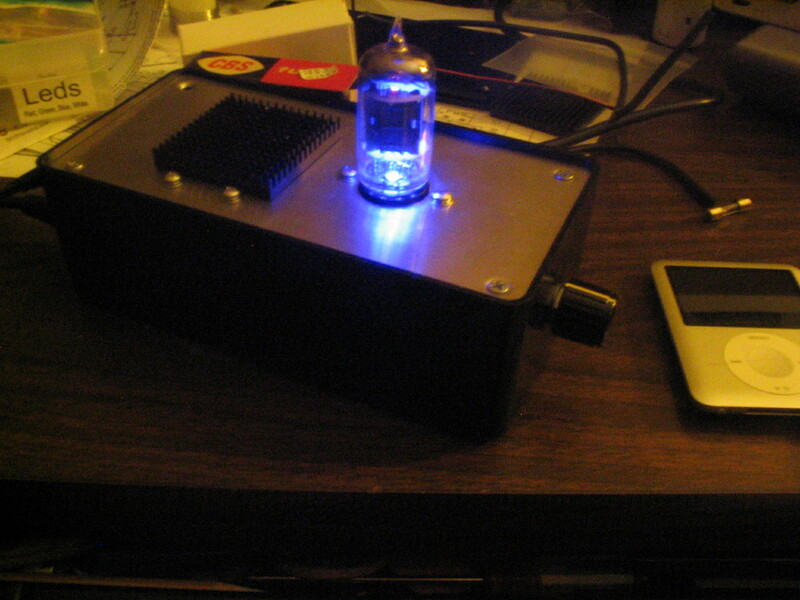 "I'm gonna take my time on the next amp....." on First tube project. I'm not happy with some of the photos - dropped down to my wife's older Canon PowerShot A75 - not so good on closeups (even with 'macro' on. I'm going back to my Digital Rebel (even though I have to resize 'em so they're not so large). Listened for quite a while last night. As the battery voltage dropped, the hiss went away with no drop in audio quality or volume. I marked the voltage at 12.52 volts, so next little project will be a heavily filtered, regulated power supply for about 12.5 volts! Too bad there's not enough room in the enclosure - or there might be... Hate to open it up again. My only three changes: I added the e12 delay relay; I only had a 1uf for C1 on hand; and I inserted a Schottky diode inline with power to prevent reverse voltages on the FETs and LM317s. Only a 0.120 voltage drop traded for safety. Just off topic i was wondering how easy this would be to make into a preamp for my LM3875 Gainclone build I've just finished making a testbed chassis for it . so the hiss went with the lower voltage glad to hear. i was thinking of using a toroid or a SMPS and making a LM317 PSU as running off a battery its really not an option for me as my source is the X-Fi on the PC to a DAC and the stuff is on all the time. I briefly looked over your images Looking good with the LED. Just wondering if you insulated both sides of the MOSFET and LM317 mounting screws. Or with the power off, measure the center tab of the MOSFET (drain) and the LM to chassis. I see you have mica, but just in case. > so the hiss went with the lower voltage glad to hear. Last night, I added two 1000uf caps across power at two places, along with a couple of .1uf at a couple of locations. Seems to quieted a bunch of hum (with lab supply) and hiss. Now not quite so twitchy on voltage - I can run it off of a Heathkit lab supply for 12V to about 13V, no issues. But, regarding a SMPS - ditto - I have a bucket full of (various brand) discarded laptop power supplies (all about 15 to 19 VDC, all at LEAST 1.5 amp, some to 3A), so yup, a nice filter / regulator is what I've already sketched out..
Oooooooo. Handmade / homebrew trumps fancy Hammond enclosure most anytime. I like it! It Just needs a lid. Nope - used four TO-220 mica insulators, with a sort-of nylon shoulder insulator for the bolt. Also some heatsink grease, for what it's worth - dunno if it'll transfer THAT MUCH more heat. Topside, just screw against metal. Due to some misalignment, the mica insulator actually bared a bit of metal to the tab, so I did have a short in initial testing, but after some realignment and fudging, it works fine now. I think I had a shard of drill debris hanging on. Yup - always good to check that TAB if it's mounted on ground - and I grounded the lid just for convenience - I love the PC boards, but I'm always just using a perf-board and point-to-point wiring, so it's convenient (and sometimes necessary for RF applications) to have a nice, large ground-plane to tie to or to just 'be near-by'. Last edited by mikeyancey on 20 Apr 2010, 12:30, edited 1 time in total. How'd you get the tube layout into Eagle? I can't find any parts in the libraries I have. CadSoft has a huge collection of libraries for all versions of Eagle Cad, uploaded by some kind users. Anybody care to double-check my schematic before I do the board layout? These tube parts didn't quite come out the way I expected them to, so I'm not sure if it's laid out right. I'm also not positive about the potentiometer, but I think I got that laid out correctly as well. I ordered some IRF510's at a local electronics shop and they gave me NTE66 MOSFETS will these work?